Sorry, this is my first post, but the struggle with depression has hindered my motivation to blog. Truth is that I’ve finally come to accept that the traumatic events that occurred in the past five years have changed me. By the grace of God, I believe changed me for the better. It’s been a rough and hard journey, especially the past year, but here I am and so are you! Thanks! Honestly, if I wasn’t getting 10+ emails a day of people signing up for my blog, I doubt you’d be reading this. 😕 If you’ve followed me before or this is new to you, blogging is something I know God wants me to do, but I’ve been resistant to it because I really don’t want to be transparent. Who does? 🤷🏼‍♀️ Especially, when you battle mental illnesses that are coupled with guilt, shame, and stigma. Wow … I can hardly believe I just typed that. In some ways, as strange as it sounds, it’s extremely freeing too. Likely because I have known God wants me to be transparent about this stuff. I’m also a recovering perfectionist and don’t want to obsess over it … so, I’m just going to do it. Having countless ideas and thoughts at once makes deciding what to finally write about a challenge, now a days. Again, I’m just going for this. It’s time. I’ll try to make it easy to follow my thought processing and please forgive the grammar and typos in advance. This is going to be as real as I can get … imperfections and all. Anyway, I’m not going into the clinical description of obsessive compulsive disorder, attention deficient disorder or of severe, re-occurring, chronic depression. If you don’t understand them, keep reading and you will. I’m here to welcome you to my blog and journey of healing and restoration … basically, life. We’re all survivors of something, most of us, a lot. Learning to forgive, to stop looking back, finding things to be grateful and thankful for, while embracing the healing journey is what will move us forward into our God given course and destiny. 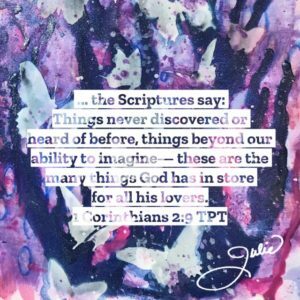 I’m grateful the traumas and depression served as a catalyst to get me totally, completely, unreservedly dependent on God, the Word and feeding my spirit daily … all day AND has gotten me back into my art studio daily, now for about 3 weeks. This is huge in that I haven’t done this since before graduate school, nearly two decades ago. It’s different this time because I’ve accepted that I am changed and stopped comparing myself to who I used to be and/or others. Taking life one at a time, I want to share with you something that has contributed to this outlook. It’s an inspiring and simple, FREE online course, that you can start anytime, I’m doing. 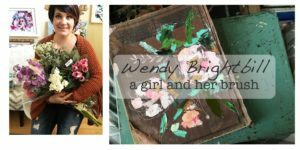 I’ve encountered some really inspiring artists on instagram and Wendy Brightbill is one of them. Check out the course, join in … you have nothing to loose and quite possibly a LOT to gain. 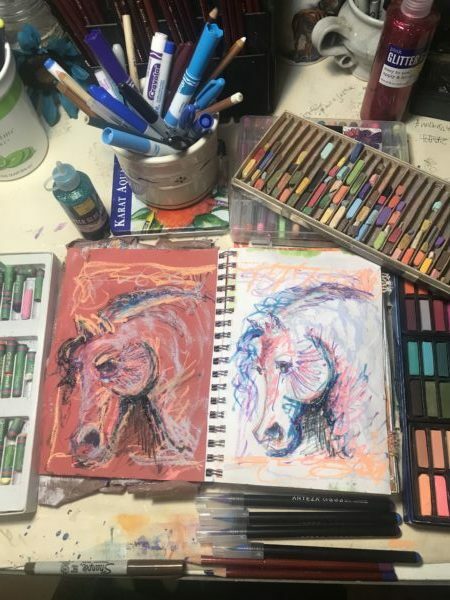 She’s a survivor of depression and a working artist that uses art as therapy. I’m on the 3rd day and we were to make a public commitment for accountability. Mine is to blog at least weekly and produce an art journal page daily. It’s not as easy as it sounds, I already know, but I also know that with God, I can do this. I’m gonna try to post pics of my artwork and hope to share with you what I’m using, the processes, etc. First, I plan to post the finished pieces here, which are all for sale … with 100% of the proceeds going to support the FREE of CHARGE services my public charity, Beauty From Ashes™ Ministries provides: counseling, mentoring, retreats, training and consulting. My stories on instagram and facebook fan page are the most up to date of my day to day activities, especially in the studio … if you’re interested. Ok, I also don’t want these posts to be books! So, with that said, I’m ending this! Again, thanks for joining me as I #embracethejourney of #beautyfromashes and #30DaysofCreativePractice. I’m hopeful I’ll be able to encourage and inspire the artist in you.